It's been almost a year since Zorin OS 6 made its debut, and since then several minor updates to the user-friendly Linux distribution have been released as well. On Thursday, however, the Zorin project team rolled out a release candidate for Zorin OS 7, the next major version of the software. “Zorin OS 7 brings about a plethora of changes and improvements ... and an enormous design overhaul,” wrote the project team in the release candidate's official announcement. Ubuntu-based Zorin OS has always been a particularly compelling choice for those making the transition to Linux from Windows, but updates in this new version promise to make it more attractive than ever. Here's a rundown of some of the highlights. Zorin OS 6 was based on Ubuntu 12.04, but this upcoming new release is based on the newly released Ubuntu 13.04, or “Raring Ringtail.” Included in that latest Ubuntu release are performance and quality improvements that make it the “fastest and most visually polished Ubuntu experience” to date, Canonical says. Also updated, as one might expect, is the Linux kernel, version 3.8 of which forms the basis of Zorin OS 7. Kernel 3.2 was what was used in version 6 of the software. Besides a raft of updated software, Zorin OS 7 also introduces some key new packages. Pidgin replaces Empathy for instant messaging, for example, and Geary Mail replaces Mozilla Thunderbird for email. 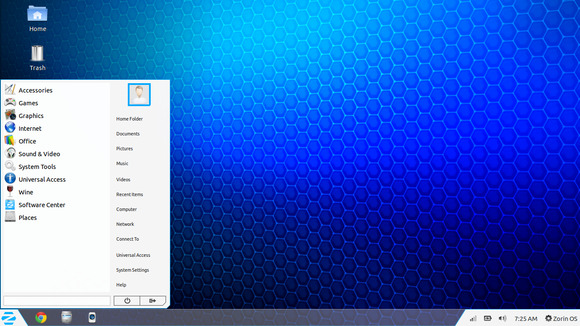 As part of Zorin OS's design overhaul, meanwhile, the software gained a new logo (shown above) as well as a brand-new desktop theme. Several tools in Zorin OS 7 also offer considerable customizability and ease of use. Among them are the Zorin Desktop environment with Zorin Menu and the Zorin Look Changer, which can even be used to make your desktop look and feel like Windows 7, XP, Vista, or Mac OS X, if that's what you want. The Zorin Web Browser Manager, on the other hand, aims to offer easy installation of Web browsers. Last but not least, Zorin OS is “much faster than Windows 7,” its creators say, and it offers all the top-notch security and stability benefits that come along with Linux. Though it's not intended for production use, a 32-bit version of the Zorin OS 7 Core release candidate is now available as a free download for testing purposes. When the final version is released, a 64-bit version will be available as well.